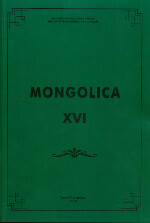 The sixteenth edition of the “Mongolica” magazine is dedicated to 180th anniversary of Grigory Nikolaevich Potanin (1835—1920), the prominent Russian explorer of Central Asia, ethnographer, collector of Mongolian folklore, one of the founders of the Siberian regionalism, publicist and botanist. This issue consists of the following parts: “Historiography and Source Studies”, “Literature, Folklore, Linguistics”, “Reviews”, and “Our Translations”. The articles are written by both distinguished scholars and young researchers in the field of Mongolian studies. Reviews of new books make the issue topical. The papers are written in keeping with the research priorities of modern Mongolian studies, with special regard to the matters of history and culture of the Mongolian ethnic groups, which gives the articles great social, historical and practical value. The article deals with the activity of the Russian military researchers of Mongolia in the early 20th century. After the defeat in the Russian-Japanese War (1904—1905) Russia's ruling circles were forced to think seriously about strengthening the position of our country in the Far East and, in particular, in Mongolia. Russia sent several intelligence expeditions to Mongolia, the purpose of which was to study the political situation in the country, as well as the activity of Chinese and Japanese there. Those expeditions opened a new page in the study of Mongolia by military investigators. Key words: Russia in the Far East in the beginning of the 20th century, Russian military expeditions in Mongolia, Mongols’ attitude to Russia, China and Japan, A. M. Baranov, Yu. Kushelev, A. D. Khitrovo. The article considers peculiarities of perception of a geographical space by the nomads of Inner Asia, based on the fundamental opposition “own — alien”. Unlike “own”, sacred lands, “alien” land was outside the law and was a source for plunder. After a period of aggressive wars in the West both for Turkic and later for Mongol nomads, the occupied territories have become “own”, which is in particular reflected in the land use: it was ordered and was close to the traditional ways of management in this or that historical-cultural region. However, it was very difficult for the nomads to become truly zealous masters there. Key words: opposition “own — alien”, the nomads, land management. The paper deals with the Mongolian inscription on the first Tyr stele (1413) — a little known monument of Preclassical Written Mongol which is now found in Primorye State Museum named after V. K. Arsenyev (Vladivostok, Russia). In the paper, the main grammatical, phonetic, and lexical features of the text are described, which are characteristic of Preclassical Written Mongol and Middle Mongol monuments altogether. While retaining a number of clearly archaic features, probably of Proto-Mongolic origin, the inscription contains some innovative developments which seem to date from the Post-Proto-Mongolic stage and reflect colloquial and/or dialectal influence. A few phonological and lexical features, as well as the place and circumstances of its appearance, enables us to consider it as belonging to the Eastern dialect zone of Middle Mongol. Key words: the Tyr stele, Mongolic languages, Preclassical Written Mongol, Middle Mongol, historical linguistics. The article contains the comparative analysis of Tuva and Buryat poetry, which are connected both by direct contacts and influence, and by typological convergence. The author defines that similar national traditions and folklore sources form the basis for uniform genres, concepts and character sketches. In modern texts the mental world-seeing of a poet extends “from life-in-the myth to life-in-the world”. Key words: concept, genre, semantics, character sketch, formulaicity, parallelism. The article describes a stable element of poetry — the simultaneous cries and laughter of the hero, who is going to be perished. It is characteristic of the fairy tales of the Mongols, the Buryats and Kalmyks. The author argues that this element is linked directly to the death and, more broadly, the transition rites. Semantics of simultaneous crying and laughing in folk texts corresponds to the semantics of ritual and symbolizes inevitable revival, that follows the death. Key words: folklore, poetics, ritual, traditional culture, mongolian peoples. The creativity of the educator S. Buyannemeh is a reflection of his life principles, ideas and beliefs. He quickly turned from a journalist in the great writer. His works have become a phenomenon in the life of the new Mongolia and its culture. Key words: new literature, revolution, tradition. The report written by A. I. Bordzinkevich, a student of the Saint Petersburg Imperial University, about his trip to the Yandyko-Mochazhny ulus has been kept in the Archive of the Orientalists of the Institute of Oriental Manuscripts. The author wrote that the aim of his trip was to study the written Kalmyk language and its phonetics among contemporary native speakers. A. I. Bordzinkevich also drew a detailed miniature map of this ulus, wrote down in great detail his observations about the Kalmyk administrative system and everyday life of the Kalmyks and the Buddhist monasteries. The report will be of interest to researchers and the general public. Key words: capital, the Kalmyks, khurul, khoton. The publication describes the history of the project for the preparation of a textbook on the history of the Mongols. It was ordered in 1927 by the Ministry of Education and the Academic Committee of the Mongolian People's Republic to the prominent Russian explorer of Central Asia, G. E. Grumm-Grzhimailo. The concept of this work, it’s structure and form of presentation was created by Grumm-Grzhimailo in correspondence with the scientific secretary of the Academic Committee Ts. Zh. Zhamtsarano. Firstly planned as the secondary school textbook, this project was expanded by Grumm-Grzhimailo into a full scale university course. The letter from Zhamtsarano to Grumm-Grzhimailo, kept in the archives of the Russian Geographical Society, is added to the essay. It illustrates the progress of creation of the textbook and illuminates all problems of research, organizational and ideological nature, because of which this fundamental text on Mongolian history has never been published either in Mongolia, or in the USSR. Key words: History of the Mongols, G. E. Grumm-Grzhimailo, Ts. Zh. Zhamtsarano, Scientific Committee, unrealized project.